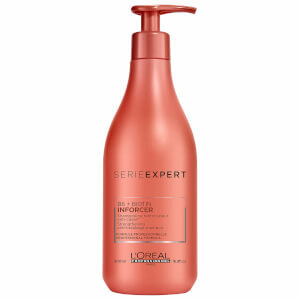 Deeply replenish weak, fragile hair prone to split ends and breakage with the L'Oréal Professionnel Serie Expert Inforcer Shampoo and Masque Duo; a pair of complementary hair-care treatments that work in tandem to cleanse, hydrate and nourish for resilient locks with improved health, texture and luminosity. A specially designed treatment to tackle breakage and split ends. Harnessing the strengthening properties of Biotin and Vitamin B6, the shampoo gently cleanses daily dirt and impurities while working to restore hair density and resilience. Ideal for long hair prone to frizz and fallout, the shampoo leaves hair feeling replenished and fortified with a soft, supple texture. A rich, powerful treatment specifically developed for weak and fragile locks. 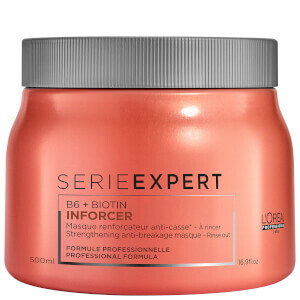 Utilising a strengthening blend of Vitamin B6 and Biotin, the creamy hair mask envelopes hair with moisture and nutrients, seeking to impart a soft texture and minimise the appearance of split ends. 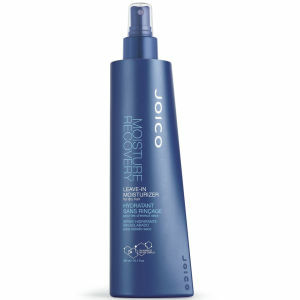 Perfect for long hair in need of a boost, it improves manageability, resilience and lustre for healthier looking locks. Shampoo: massaje no cabelo molhado e faça espuma antes de enxaguar abundantemente. Máscara: aplique uniformemente no cabelo enxuto com a toalha. Deixe atuar durante 3 a 5 minutos. Enxague abundantemente. Shampoo: Aqua/Water, Sodium Laureth Sulfate, Sodium Chloride, Cocamidopropyl Betaine, Dimethicone, Sodium Benzoate, Amodimethicone, Carbomer, Guar Hydroxypropyltrimonium Chloride, Trideceth-10, Glycerin, Hexylene Glycol, Salicylic Acid, Glycol Distearate, Pyridoxine Hcl, Citric Acid, Mica, Limonene, Peg-100 Stearate, Steareth-6, Phenoxyethanol, Coco-Betaine, Trideceth-3, Ci 77891/Titanium Dioxide, Peg-45m, Benzyl Salicylate, Biotin, Linalool, Geraniol, Benzyl Alcohol, Acetic Acid, Fumaric Acid, Ci 15510/Orange 4, Ci 17200/Red 33, Bht, Sodium Hydroxide, Parfum/Fragrance. Masque: Aqua / Water, Cetearyl Alcohol, Behentrimonium Chloride, Cetyl Esters, Phenoxyethanol, Amodimethicone, Isopropyl Alcohol, Pyridoxine Hcl, Citric Acid, Limonene, Chlorhexidine Digluconate, Trideceth-6, Biotin, Benzyl Salicylate, Cetrimonium Chloride, Linalool, Ci 15510 / Orange 4, Ci 17200 / Red 33, Parfum / Fragrance. C197676/1.